Confused by the knife sharpening task that we are stuck doing? Well, you’ve come to the right place. Let me try and explain in plain ol English. Knife Sharpening is probably the most important and least understood aspects of oboe reed making. My teachers always used to tell me that there are two “secrets” to reed making. Well, I can honestly say, they were right. If your knife isn’t sharp in the correct way, then you won’t “scrape” the cane off. You will “rip” the cane off. A good example of this is when you push a bit too hard and you find half the side or corner of the tip on your plaque. In the infinite words of the great pool player Minnesota Fats, “Your not supposed to do that”. Before we can talk about the actual knife sharpening, let’s talk about a bit of theory first. the double hollow ground, and the bevel knives. The blade on a double hollow ground knife is very different than the bevel knife, so it must be sharpened differently. 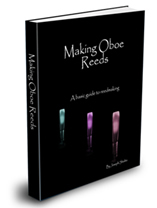 An oboe reed knife has an edge which sticks out a bit more on one side. This little piece of metal is called the burr. This is what cuts the cane and it does so in a scraping motion. As you can see, getting the burr is orrect is the secret. More on that in a bit. The goal with the bevel knife is to get the edge completely even. So how do we sharpen these things? Here is some information on sharpening double hollow ground knives, and bevel knives.